At one year of age, children should be transitioned off formula onto whole milk. One year olds need a diet that is high in fat for continued brain development. Children continue to myelinate (coat) brain and nerve cells until 2 years old. When transitioning to cow’s milk from formula, I recommend an abrupt transition. While some people gradually mix formula and cows’ milk, I find this confuses the issue. As our children near 12 months, we offer them a sippy cup with 3-4 ounces of whole milk. At one year, we work toward serving milk only at meals. Whole milk should not be given in bottles. Serving cows’ milk in bottles only delays a transition that needs to happen. Importantly, cows’ milk should be only a portion of a 1 year olds diet. Cows’ milk, unlike infant formula, is not complete nutrition. Some one year old will drink milk instead of eating other foods. Children who drink milk instead of solids eventually will can develop iron deficiency anemia. 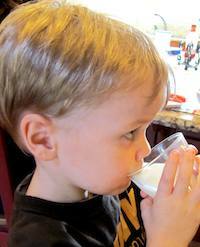 Children only need 10 to 12 ounces of whole milk a day between 12 to 24 months. A 1 year old that is eating good quantities of a variety of solid foods could tolerate more than 12 ounces daily. It is the children who drink 30 to 40 ounces of milk and refuse solids that have health issues.